Francis Preston Blair, Sr. was an American politician. As editor of the Washington Globe, he was a keen supporter of the Democrats, and formed part of President Andrew Jackson’s ‘kitchen cabinet’. After briefly supporting the Free Soil party, he helped to launch the new Republican party in 1854. 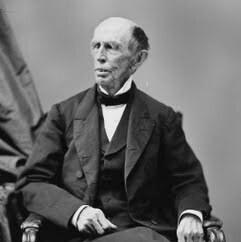 At the outbreak of the Civil War, he personally conveyed Lincoln’s offer to Robert E. Lee to command all the Union armies, which Lee rejected. After Lincoln’s re-election, Blair organised the abortive Hampton Roads Conference, where peace terms were discussed with the Confederates, but no substantial issues resolved. Two of Blair's three sons were prominent in American politics.